Lower levels of seismic activity continue to be recorded at the Kick ’em Jenny submarine volcano, with less than 20 earthquakes associated with the system occurring from 4:00 pm on 24 July to 6:30 am on 25 July, according to the UWI Seismic Research Centre. “This represents a significant decline in the level of earthquakes associated with the activity so far. We will continue to monitor throughout the day to develop a better understanding of the current state of the system,” said the latest advisory from the Centre. A statement from the Grenada National Disaster Management Agency (NaDMA) on Saturday morning said, “if this trend continues, NaDMA and the SRC will make the decision to lower the alert level. However, the Orange alert level remains in effect. The general population is again reminded that there is no need for panic, and that people should go about their daily lives as normal,” reminding the population that the official advisories on this matter and all other disaster related matters will come directly from the NaDMA. 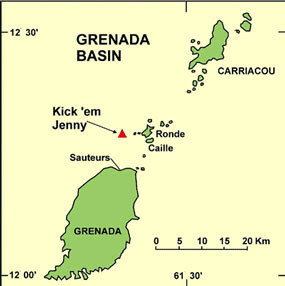 In the meantime, Acting Coordinator at NaDMA, Terrence Walters, has confirmed that upgraded equipment is being installed at the main monitoring station for Kick ’em Jenny. He explained that this is part of the Unit’s ongoing upgrading of its monitoring systems, and that this will provide more precise data about the activities that are taking place at the volcano. The Centre which is located in the compound of a secondary school overlooking the area of the volcano, comprises of computers and other monitoring devices that will alert the Seismic Unit and other authorities when conditions have changed with volcanic activities. Data from the UWI Seismic Unit has disclosed that the volcano erupts approximately every 10 years, and the last time was back in 2001. Last Thursday morning, the volcano which is located 8 miles north of Grenada increased in activity, with more than 150 small earthquakes being registered between 1:00 am and 5:00am. As a result, the UWI Seismic Unit changed the alert system to orange, which means that if an eruption occurs, it may be with less than 24 hours notice. Chief Fisheries Officer in Grenada, Justin Rennie, has disclosed that the “ship to shore” monitoring equipment of the Fisheries Dept is continuously disseminating advisories to the almost 700 fishermen and fishing vessels that are registered with the Unit. “Since the announcement of the change alert to Orange, we have decided to continuously inform all who are registered with us via our communications systems, that they should comply with the request to observe the 5 km exclusion zone, as advised by the National Disaster Management Agency,” said Rennie.